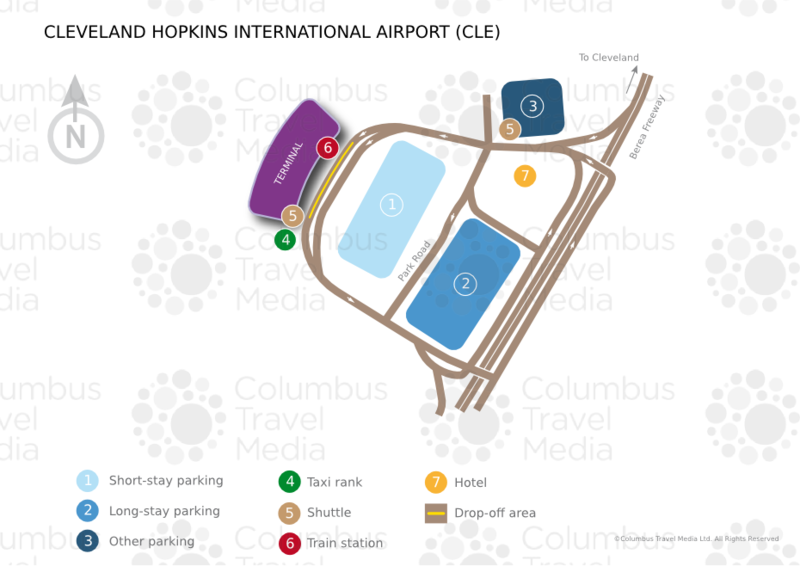 The largest airport in Ohio, Cleveland Hopkins Airport is a short distance from the city of Cleveland. Our guide to the airport includes important information on public transportation, nearby accommodation and airport facilities. The Airport Information Desk (tel: +1 216 265 6000) is located in the main terminal, on the ticketing level near Security Checkpoint B. The Airport Welcome Center is also located at the centre of baggage claim, between carousels 5 and 6. In addition, ‘Airport Ambassadors’ are on duty throughout the terminal area. From central Cleveland, take Interstate 90 for 3km (2 miles) and continue south on Interstate 71. Bearing right, continue southwest onto Berea Freeway (keeping right onto the ramp) before turning west onto Terminal Drive, which is the terminal access road. Cleveland Hopkins International Airport is located 16km (10 miles) southwest of Cleveland. Shuttle:There is a coach shuttle service between Cleveland Hopkins International Airport and Oberlin (tel: +1 216 941 7433; www.airportoberlinshuttle.com); fares start at US$15. Numerous hotel shuttles and door-to-door express shuttles are also available. Taxi:Taxis are available outside the baggage reclaim level. Cleveland Hopkins International Airport offers a dedicated taxicab service, with a fleet consisting of 110 white vehicles. Local companies Ace Taxi (tel: +1 216 361 4700) and Americab (tel: +1 216 881 1111) jointly operate this service. Flat rates apply based on mileage, and the fare into Cleveland is around US$23. Various limousine/minicab operators also serve the airport. Rail:Cleveland Hopkins International Airport is served by the city's RTA Red Line train service (tel: +1 216 566 5100; www.riderta.com), which runs to the city centre every 15 minutes and takes less than half an hour. The train station is located on the lower level of the airport, below baggage reclaim. The single fare into Cleveland is US$2.50. ATMs are located at various locations within the terminal building. Bureau de change desks can be found both pre and post-security. Dining facilities at Cleveland Hopkins International Airport include fast-food restaurants, cafés, bars and pubs. These are situated on the ticketing level and the concourses, as well as in the main terminal’s food court. There are various shops at Cleveland Hopkins International Airport, including a cigar shop, children’s retailer and fashion outlets. The main terminal and concourses C and D offer the largest choice, while concourses A and B are limited to newsagents. A lost and found service (tel: +1 216 265 0777) is available on site. For items lost on an aircraft, passengers are advised to contact the airline. There is a multifaith chapel next to the concourse B security area. Massage services and shoeshine booths can be found in each concourse, as well as a pet relief area and mother’s room. 24-hour medical assistance is available by contacting staff via one of the courtesy telephones. There are two meeting rooms in the airport that are available for rent on a first come first serve basis (tel: +1 216 265 6086). Free Wi-Fi internet access is available throughout the airport. Public telephones are positioned at numerous points within the terminal, while white courtesy telephones are available for emergencies. Additionally, there is one post box located in front of the security area. Cleveland Hopkins International Airport is fully accessible to disabled passengers. Wheelchairs, lifts and escalators can all be found at the airport; passengers requiring special assistance should contact their airline prior to travel. Outside the terminal, dedicated disabled parking areas are available in the car parks and some car hire companies can provide adapted vehicles for disabled drivers if booked in advance. There are five different on-site parking options, which are available 24 hours a day. Contact Standard Parking (tel: +1 216 267 5030) for further information. Short and long-term parking is available within the airport grounds. Car parks are linked to the airport via pedestrian walkways or shuttle buses. Car hire companies at Cleveland Hopkins International Airport include: Alamo, Avis, Budget, Dollar, Enterprise, Hertz, National and Thrifty. These operators are located in an off-site car hire area, which is served by 24-hour shuttles from the lower level across from baggage reclaim 7.